Following is a list of the eight new iOS apps that this year best exemplified the intersection of sound/music, interactivty, and mobility — that is, of apps designed for the Apple iPhone, iPod Touch, and iPad. Last year’s list of best iOS apps had 10 entries, but the shorter list this year isn’t intended as any sort of sign of a diminution of creativity in iOS development. Quite the contrary, this year’s list is simply more categorically selective. There are at least two major branches of iOS sound apps right now: those that emulate (or otherwise augment) instrumentation, such as virtual pianos and turntables (as well as guitar tuners and effects pedals), and those that explore new realms of interactivity. In its widely reported year-end “Rewind” assessment of “app trends,” Apple labeled these categories, respectively, as “Band in a Hand” and “Generative Art & Sound” (which combines visual and sonic tools). This year-end Disquiet.com list focuses on the latter. Further winnowing the potential contenders, all the apps listed below were released this year. 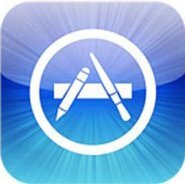 I thought about including previously existing apps that showed a major upgrade this year, but decided to focus on new apps, in large part because an insignificant number of apps from 2009 in this interactive realm showed any significant improvement in 2010. 1. 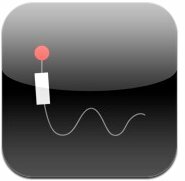 Aura 2: Flux: This ambient-music creation tool nudges toward instrument territory (or, more to the point, compositional territory) but emphasizes the casual playfulness of its own homegrown visual interface (iTunes), one that encourages an exploratory approach. Various moods and sounds can be combined to create systems-fueled compositions based on how elements are organized. 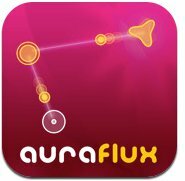 Aura’s interface provides a kind of visual programming language made of building blocks (and, like another app listed here, Reactable, is thus reminiscent of the old Logo programming language). More details at the developer’s website, higefive.com. 2. 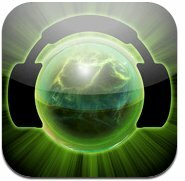 Immersion Station: This seemingly simple app allows you to place a set number of globes on a grid, each globe representing a different sound loop (iTunes). The grid is distorted based on a one-point perspective, which means that the further back a globe is placed (the closer it approaches the horizon), the quieter it is in the mix. The real clincher is an “evolve” mode that takes a given arrangement and slowly shifts it as time progresses. The app was developed by longtime electronic musician Steve Roach and software engineer Eric Freeman. More details at immersionstation.com. 3. 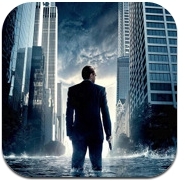 Inception: This is a bespoke edition of the RjDj app, developed as a free adjunct to the Inception film (iTunes). It processes the sound around you in real time, transforms it in ways that the developers liken to a dream state. Some of the transformations involve musical cues from the film. The common software-development term for this kind of thing is “reactive,” or “augmented.” An even more appropriate word would be “wonderful.” Additional Disquiet.com coverage: a story I wrote about the app’s release for boingboing.net, a list of the RjDj/Inception developers’ favorite aspects of the apps, and a list of the best movie scores of 2010 (which includes Inception). More details at inceptiontheapp.com. 4. Mixtikl: This app almost doesn’t belong on this list, because there is nothing casual about it (iTunes). It is a highly detailed generative-sound creation tool, one that has far more in common with computer music software than with the playful, intuitive apps listed here. However, even if that does put it strongly in the “instrument” category, the fact is that it has no analog (so to speak) in the realm of traditional musical instruments. It also includes a growing library of in-app sound generators. 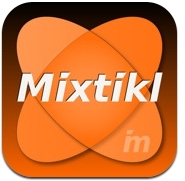 As a sign of its non-iOS-specificity, there are Mixtikl versions for a growing number of operating systems, including Windows and Mac, at the developer’s website, intermorphic.com. 5. 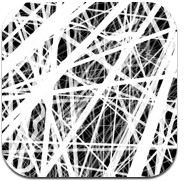 Thicket: This is, at its essence, an interactive single (iTunes). The touch screen lets the user alter in various ways a piece of music — an alternately bouncy and reflective bit of refined techno — and the visuals associated with it. The alterations depend on the number of fingers used, the patterns drawn, the speed at which they are drawn, and the angle at which the device is placed. Additional Disquiet.com coverage: an interview with one of the app’s developers, “Being Decimal: The Anticipatory Pleasures of the Thicket App.” More details at intervalstudios.com. 6. Reactable: This is, like Flux, a node-based ambient-music tool with its own internal structural logic (iTunes). It is the second most complex of these apps (after Mixtikl), but the invested time is rewarded handsomely. Like Aura (mentioned above), its building-block interface and systems-oriented progressions suggest a distant lineage to the Logo programming language. It originated as physical, tabletop interface and was later ported to a software-only tool. More details at reactable.com. 7. 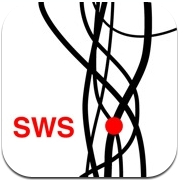 Sonic Wire Sculptor: In simplest terms, this iOS app takes line drawings and turns them into sound (iTunes). Create new compositions by carefully delineating a structure, or just input an existing image, like a face, and listen to how it sounds. Then — and this is what really pushes Sonic Wire Sculptor over the top — rotate the line drawing in three-dimensional space to hear geometric variations on the musical theme. More details at sonicwiresculptor.com. 8. 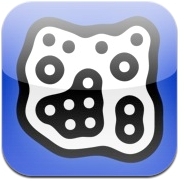 SoundyThingie: This one is the sole iPad-only app on the list (the developer has stated that iPhone development is “tricky because iPhones have very weak processor”). It provides a blank slate on which the user draws lines, lines that are subsequently interpreted as sonic instructions (iTunes). Speed, position, and other factors influence the resulting audio. Of all the apps here, this one probably has the most self-evident roots in the tradition, so to speak, of non-traditional graphic scores in avant-garde music. More details at linienmusik.net. Â¶ These are all iOS apps, which is not intended to dismiss mobile-app development on Android (I own a G1 phone, and when its contract runs out at the start of 2011, I will almost certainly replace it with another Android-based phone), Windows 7, or any other operating system, or browser-based (largely Flash) interactive sound toys. Much of the energy that for over a decade fed the audio-games/sound-toy world in web browsers seems to have migrated to Apple’s operating system, but here’s to hoping that the development world diversifies in 2011. Â¶ There are, indeed, other types of sound apps, including streaming audio, like Pandora and Soundcloud; so-called “soundboards,” which collect sounds related to a specific subject, like The Simpsons; and brand fodder, which provide fans with a virtual trinket, the app equivalent of glossy pamphlets purchased from concert concession stands. And judging by sheer number, “farts” could easily be its own subcategory. Â¶ I considered including Papa Sangre on the list (iTunes) because it is (reportedly) the first ever audio-only video game. However, much as that sounds like a wonderful melding of Janet Cardiff and Nintendo, there is no sound manipulation within Papa Sangre, so it doesn’t really fit into this list. And needless to say, if anything prominent is missing, do not hesitate to let me know. damn that’s shame to hear! but is there not a piracy problem with ios as well? Hi all. What about ReBirth for iPad (http://appadvice.com/appnn/2010/12/review-rebirth-ipad/) and iMS-20 for iPad (http://www.korg.com/ims20)? Cheers and happy new year everyone. Have really been enjoying Filtatron for the past week. Surprised it didn’t make the cut. Thanks for the Mixtikl info. As for those others (Rebirth, iMS-20, Filtratron), they’re quite good, but too close to proper instruments. Great things, just beyond the purview of this list.